Once You Go Black (Mesa) | SPACE-BIFF! ← Celebrate Space-Biff! with a Contest! So faithful, they even worked in the lambda. This is going to be biased. 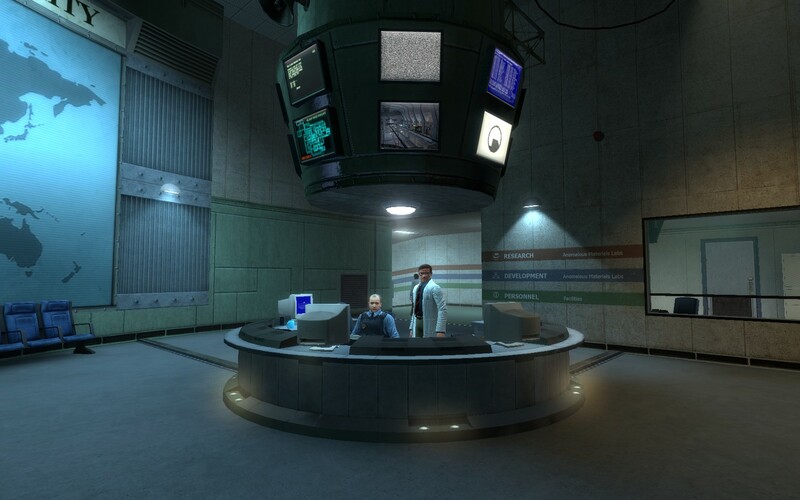 I went into Black Mesa with a heaping dose of skepticism, because mocking up a few nostalgic screenshots seems like one of those things that anyone can do, though when I say “anyone” I’m referring to lots of people other than me. 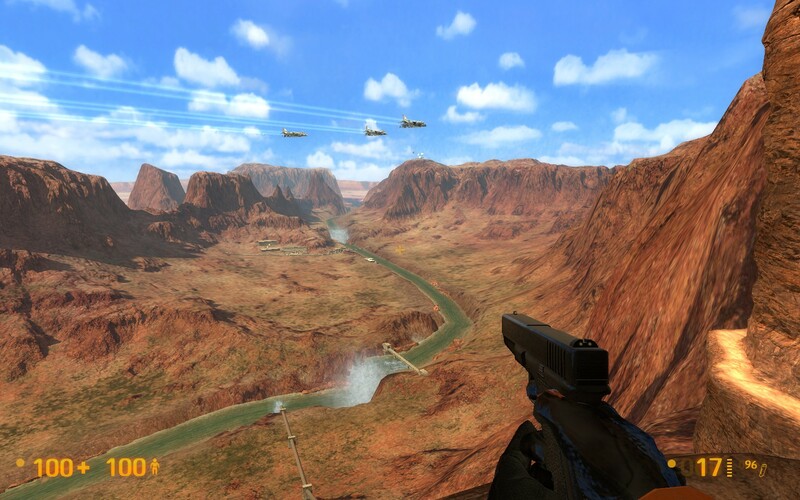 How could a mod team recreate one of gaming’s most seminal moments? How could a pack of amateurs capture the terror of the Blast Pit, the pacing nightmare of Apprehension, or, crud, even the slow-burn tram-ride intro? Well, they did it. Mostly. 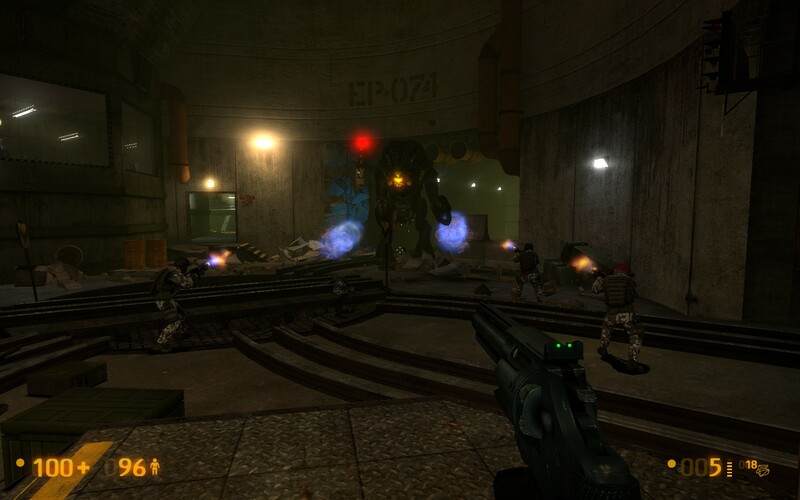 It’s thirteen of Half-Life’s seventeen chapters (the rest are coming later, presumably), recast into a completely free mod that anyone can play — again, for free — so long as you’re willing to peruse some download links and install Steam. For free. They… they have faces! Faces of their own! So here we have something peculiar: a remake of one of gaming’s most hallowed (sometimes too hallowed?) artifacts. 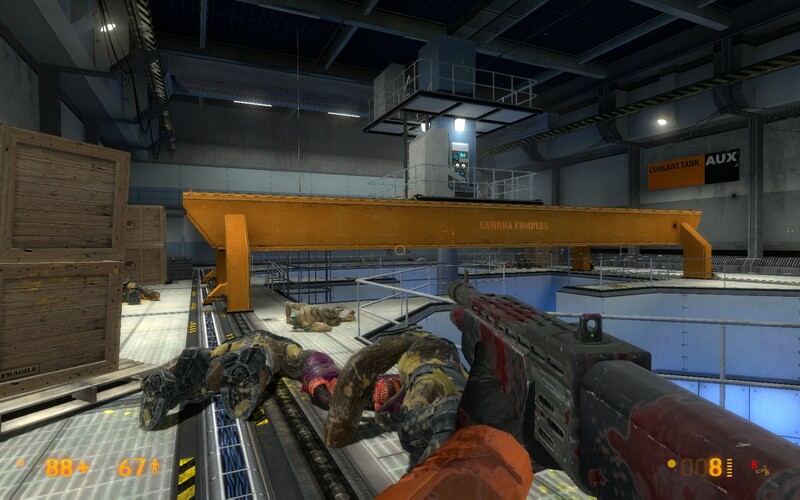 If you’ve played Half-Life, then this is an upgraded version of your memories. It isn’t so spot-on that you won’t recognize some differences, at least if you played the original as many times as I did, but in a way the graphics are as I remembered them, though of course old screenshots have confirmed that as time passes and visuals improve and my initial fears of the Black Mesa Research Facility remain constant, I’ve been sanding down the sharp edges and filling in the gaps. Which is to say, this is how Half-Life looked to my middle-school self. If you haven’t played Half-Life, then you should, and this is the version you should play. I mentioned that this is 13/17ths of the original, but the remainder is the part that everyone added as the “But…” when they were talking on and on about what a great game it was. I enjoyed the experience some percentage more for it having lost that extra bit at the end, the crazy segments that relied too much on jumping and too little on logic. I could have done without those last four chapters back then, and I’m happy to do without them now. At any rate, we’re told they’ll added to Black Mesa someday. But here’s what I love about Black Mesa: It isn’t a straight one-to-one replication, though it’s close enough you could say it’s 1:1.003 or somesuch. Certain bits have been updated, and the addition of things like physics and dynamic lighting and an infinitely-charged flashlight work wonders. There are little ways that it plays with a veteran’s expectations — it’s still the story of Gordon Freeman and his escape from a science project gone wrong all over Black Mesa, of course — but such trivial things as distracting a barnacle with a box, or throwing flares into tinderbox zombies, or getting a weapon at a different time than you remember getting it years ago, all defy your memory of the original. Not only has its team worked to make something faithful, but they’re also playing around a bit, keeping it fresh. At more than one point, I had to stop and remind myself, “I never did this in the original,” because whatever I was doing at the time was fitting in so well that my memories were starting to bleed. They left this in, eh? At other times, perhaps that ratio of comparison remains a bit too close. Half-Life was groundbreaking for a number of reasons. A lot of those reasons were done earlier, as a well-prepared cadre of gaming’s elites will gleefully descend and inform, but few to none were done better. 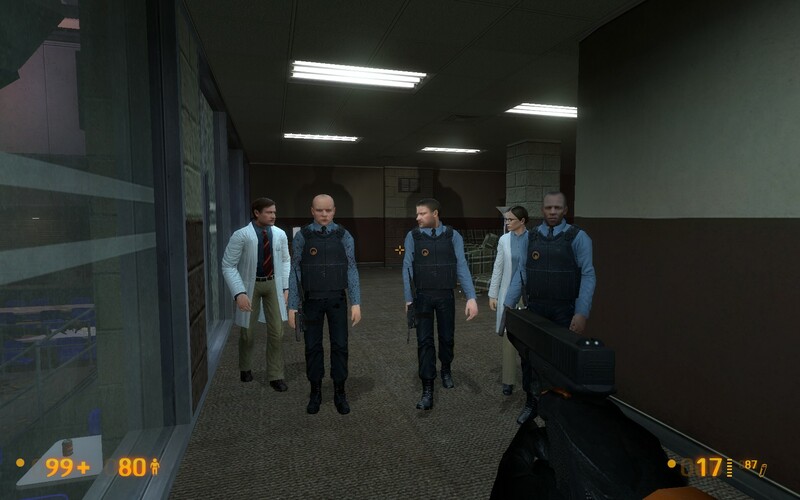 Half-Life stands out as seminal because it excelled in its manufacture, in its pacing, in its unity of design and narrative, in this and that. One of those ways was not its jumping puzzles. Strike that, maybe they were incredible back in 1998, but they certainly aren’t now. 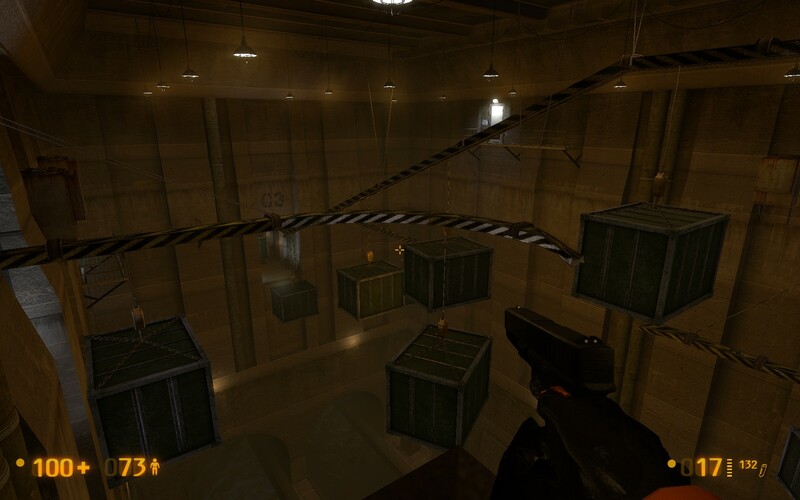 Jumping puzzles and an ill-explained crouch-jumping method are back in Black Mesa, and if you’re like me, the nubs and paint on your F6 and F9 keys will soon be worn down as you endure fall after fall and quicksave/quickload your way to victory. It feels cheap, and it is, but the game started it. Then again, that’s a small complaint. I could also talk about some clipping errors, or how sometimes rubbish in your path will block your movement and leave you jumping over tiny boxes like an overenthusiastic Olympic hurdler, or how even the upgraded Source engine is beginning to show some wrinkles, but none of those are major problems. What I do want to talk about is how I gathered a posse in the office complex, and we ran around blasting headcrabs and zombies until I had to leave them behind to go up an elevator shaft. 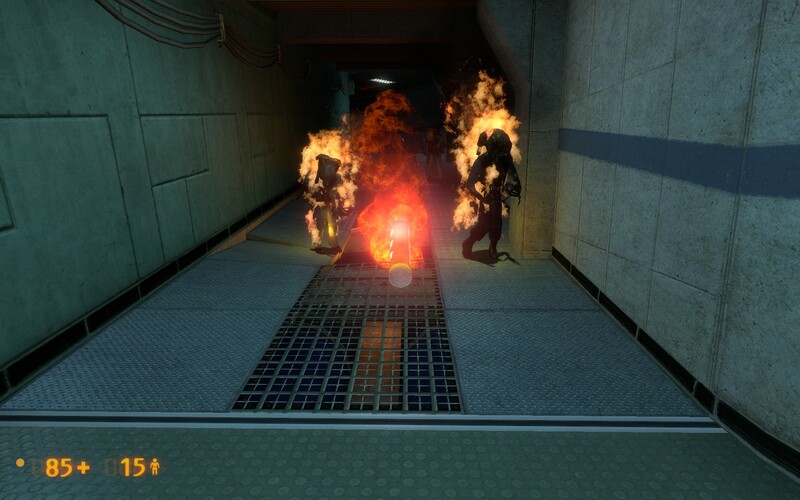 Back when I played Half-Life, I imagined that they all made it, emboldened by the help and guidance I’d given them in the bowels of the facility. Last week, I gathered the same group — looking better than ever — and when I left them behind I found myself again hoping that they could make it without me. Where I was going, they were better off on their own anyway. Or I want to tell you about walking into that room where the HECU marines who had been hounding me for an hour or so were attacked by that huge nigh-invincible flamethrower monster. That stands out as one of the original game’s most rewarding scenes, even if the satisfaction of seeing two of your enemies hammering at each other only lasts for about a half second before all the soldiers are dead and the monster turns its attentions to you. And again it was as rewarding as ever, for exactly half of one second. The entire ensuing sequence was also as dramatic and harrowing as I remember it being back in the day. The dam, bigger than ever. Or that quandary, the one that wracked at my teenage soul even without morality meters or dynamic consequences or multiple endings, when deep in the Blast Pit and low on ammunition, I found a guard holding a magnum. A few bullets for that gun could mean the difference between life and death, and I agonized over the prospect of ending his life for those bits of shaped lead and powder. (I killed him when I was a teenager, and I didn’t last week; I like to think I’ve grown). Or feeling again what everyone felt when they emerged from some tunnels onto a cliff-side in New Mexico and saw the vast impassive desert stretching out as far as the eye could see, and watched enemy jets patrolling the airspace, and recognized everything that was being telegraphed in that one masterful scene: that there would be no escape by foot, the situation had intensified, even the enemy was desperate and afraid and resorting to terrible measures. There are a hundred little things that I love about Half-Life that I rediscovered playing Black Mesa, and more things added still: the dangling jaws of zombies, the splatters of ooze and blood that grime up your equipment, the tiny improvements over the original. I never thought I’d regard smaller and faster headcrabs, squelching eyehounds, vomiting bullsquids, and killer HECU marines as old friends, waiting all this time to scare me the way I was scared years ago; or, at the very least, to remind me of being scared. I am now a brave and courageous man, after all. Look, I said this would be biased. I think this is one of the best mods I’ve ever played, and the fact that you don’t even need to own a game to play it only sweetens the deal. I could say something cliché like, “You owe it to yourself to play this mod,” but that would be weakening the truthfulness of that statement. Seriously, give it a try. There’s basically no reason not to. 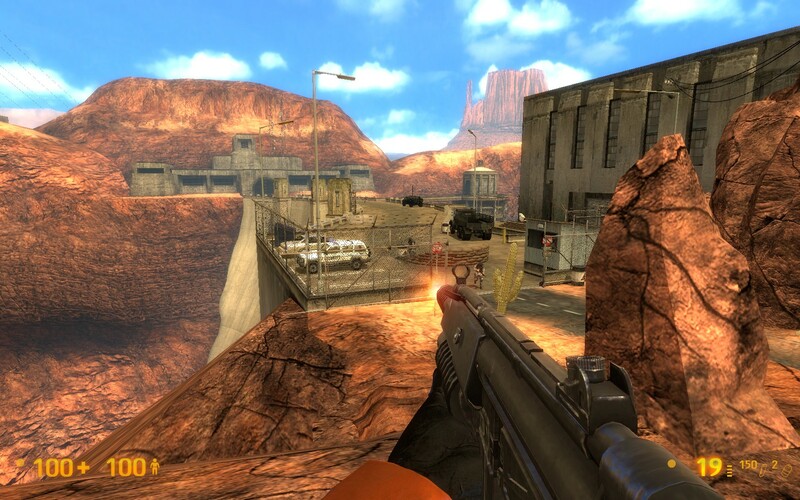 Posted on September 24, 2012, in Mod, Reviews and tagged Black Mesa, Mod. Bookmark the permalink. Leave a comment.